The new Toyota Supra is, under the skin, a BMW. As such, it has a BMW engine, and that means a confusing series of letters and numbers strewn together that just have to mean something, though it’s never clear what. 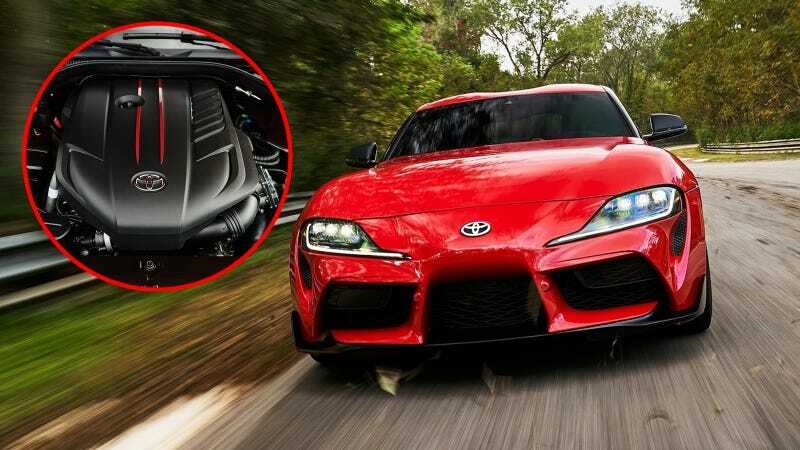 Thankfully, though, we have a neat explanation of the B58M30 01 courtesy of Engineering Explained’s new video, which also points out that the Supra’s BMW engine has a closed-deck block like you find on high-horsepower custom Subaru builds, good for taking high boost and surviving. That makes me think of the big difference between the B58 and the 2JZ: the old 2J was an iron-block engine designed at the height of the quality-over-everything Bubble Era. It has a reputation for being absolutely indestructible, particularly when bone stock. The JZ engines can handle big boost and seemingly endless abuse levied upon them by punishing tuner car drivers. BMW’s B58 is an alloy-block engine, and don’t look for reputations of un-killable motors in BMW’s recent history. But a lot of that may be that the history of tuning boosted BMW engines is short in America in contrast to Toyotas. Everybody and their uncle has met a high-horsepower 2JZ. Fewer are familiar with turbo’d M3s old and new. Still, I wonder if the closed-deck design of the B58 will validate itself on the tuning scene in a way that the 2J diehards might never expect. Less tuner-friendly for the B58 are the spray-on cylinder liners, which you don’t just re-machine and sleeve like you would something more old school. The interesting part is the above graphic, decoding BMW’s alphanumerics, telling you this is kind of a mid-range engine as far as the company is concerned, though it has a good amount of tech, like variable valve timing and variable valve lift. Another thing that stands out is that the B58 engine is undersquare rather than square, as the 2JZ was. Undersquare engines are what you could call a long-stroke engine, basically with a long, skinny path for the piston to travel. Oversquare would be a short path up a very broad cylinder bore. Big fans of the tough 2J might moan that undersquare is less tuner-friendly, with less space for bigger valves and a layout that doesn’t favor high RPM, but ardent BMW fans would be able to counter that the legendary S54 engine of the E46 M3 wailed up to high revs with glee. Alright, maybe this debate is only happening in my head, but I think about these things a great deal. Engineering Explained’s video also has a wonderful explanation of twin-scroll turbocharging, which uses a genuinely quite handy diagram for understanding how it all makes sense. As you can see, the timing of the exhaust pulses on a straight six engine would make it so that in a single exhaust manifold running to a single-scroll turbo, one exhaust valve would open up as an earlier exhaust pulse was traveling towards the turbo. That exhaust pulse would then find itself wanting to run back down towards the engine and the newly-opened other valve, rather than just to the turbo alone. Splitting the exhaust into two tracks independently running to a twin-scroll turbo isolates these pulses from each other and gives everything a clean run to the turbo itself. It’s a neat video on a good bit of science, and worth a watch in full.